TUCSON -- The Boy's 17-Under final was an international affair showcasing Canada's Michael Gaulton against Ireland's Kavan O'Keefe. Gaulton delivered a flawless performance, winning the title in two games, 21-3, 21-10. The champion put immense pressure on O'Keefe, executing steady high-percentage shots while closing the door on many rallies with impressive kills. Ever since his first juniors, Gaulton has steadily improved and will be a top contender for next year's 19-Unders. Luis Bustos helped Anthony Sullivan slam the Boys 19 Division with a dominant win over Austin Biddle and Michael Gaulton, 21-6, 21-11. Lorcan McBride became the first juniors player ever to win three events at a Nationals. McBride won the 15-Under Doubles with partner Michael Kiely, defeating David Sanchez and Ray Ure, 21-7, 21-4. McBride won the 15-Under Small Ball and 15-Under Big Ball titles earlier in the week. The Kate Conlon/Kurt Johansson Most Improved Award, The Tom Lynch Newcomer Award and The Vince Gabriele Jr. Sportsmanship Award were presented at the Juniors Awards Banquet on Thursday night. Patrick Cooke (center) was presented the Most Improved Award. Lorcan McBride (left) was given the Newcomer Award, and Josh Webster (right) was presented with the Sportsmanship Award. Carlos Espinoza, Pedro Murillo and Austin Biddle were recognized as Junior Alumni players (19-Under players that have played in at least four Junior Nationals) and were given Junior Alumni gym bags. See final results, draws and scores HERE. Thursday's matches in the 61st National Junior Four-Wall Championships produced some of the best handball and highest drama. In Boy's 19-Under action, Anthony Sullivan fought off match point to force a tiebreaker against Coleman McGrath in the championship final. The two players from the Bay Area played the third set tight for most of the duration, with McGrath holding an early 2-1 lead before Sullivan stormed back to hold a 5-3 advantage. Locked at 7-7, Sullivan made key shots down the stretch for an improbable comeback win, 7-21, 21-20, 11-9. "I'm glad it went to a tiebreaker, obviously," said Sullivan. Sullivan saw a big lead evaporate in the second game which turned into a match point opportunity for McGrath. "He got hot and was on a roll. We played close the rest of the way, and I was fortunate to come out on top." Kena Byrd-Jackson of Tucson won the Girl's 15/17-Under crown over Marisol Maldonado, 21-1, 21-8. In the 13-Under final, David Sanchez of Stockton, CA stopped Tucson's Andres Maldonado in two games, 21-5, 21-8. Lorcan McBride of Corrickmore, Co. Tyrone, Ireland was the class of the Boy's 15-Under field. McBride dominated the bracket and defeated Chicago's Ray Ure in the final, 21-5, 21-3. "Wow." an exasperated Ure exclaimed. "I was making some shots and didn't play that bad--[McBride] is just that good." Team Lattof teammates Irena Hong and Rimata Halabi faced off for the Girls 13-Under title with Hong edging Halabi 21-10, 21-19. In the youngest age division, Andres Cordova was looking at a 6-10 deficit against Team Juarez teammate Eder Reneteria in the Boys 11-Under final. Cordova took back the serve to start an improbable comeback to win, 21-17, 15-21, 11-10. See Thursday's results and the updated draws HERE. 19 A Semifinals: Carlos Espinoza d. Rory Rakochey, (19), 11, 5; Austin Biddle d. Pedro Murrillo, 9, 12. Final: Biddle d. Espinoza, 14, (11) 4. 19 B First Round: Bryan Pacheco bye; Christian Solis d. Julian Aviles Figueiredo; Greg Cameron d. Julian Rivera, (10), 18, 1; Danny Romero d. Jimmy Connolly, 3, 1. Semifinals: Pacheco d. Solis, 18, 10; Romero d. G. Cameron, 6, 9. Final: Pacheco d. Romero, 7, 7. 19 Cons. Semifinals: J.A. Figueuerida bye; Rivera d. Connolly, 9, 17. Final: Rivera d. Figueuerida, 7, (12), 4. 17 A Quarterfinals: Esteban Camacho d. Ben Flynn, 7, 10; Jake Cervantes d. Jake Moore, def. ; Adam Clark d. Sam Ure, 8, 8; Sam Richer d. Noe Rios, 12, 11. Semifinals: Camacho d. Cervantes, 11, (12), 2; Clark d. Richer, 13, (18), 6. Final: Clark d. Camacho, (11), 8, 8. 17 B: First Round: Carlos Castillo d. Alejandro Sandoval, 14, 10; Sam Brekke d. Danny Connolly, 0, 1. Quarterfinals: Aron Cameron d. Angel Mariscal, (17), 10, 3; Nicholas Roberts d. John Silva, 20, 17; Vince Fork d. Castillo, 20, (13), 6; Ruaric Cusack d. Brekke, 14, 5. Semifinals: Roberts d. Cameron, 7, 13; Cusack d. Ford, 4, 8. Final: Roberts d. Cusack, (14), 14, 10. 17 Cons. First Round: Castillo d. Mariscal, 2, (20), 0; Sandoval d. Brekke, 13, 10; Silva d. D. Connolly, 2, 2. Semifinals: Castillo d. A. Cameron, 2, 5; Sandoval d. Silva, def. Final: Castillo d. Sandoval, 19, 4. 15 A Semifinals: Guillaume Chouinard d. Carter Rakochey, 8, 1; Collin Peters d. Oisin Hallahan, 17, (7), 10. Final: Chouinard d. Peters, 14, 9. 15 B Quarterfinals: Jamie Moylan bye; Josh Webster d. Diego Hernandez; Isaac Rios d. Johnny Cooke, 16, 2; Jessie Davis d. John Franks, 6, (5), 5. Semifinals: Moylan d. Webster, 9, 3; Davis d. Rios, 10, 7. Final: Davis d. Moylan, (15), 18, 8. 15 Cons. Semifinals: Webster d. Hernandez, 2, 2; Franks d. Cooke, 11, 11. Final: Franks d. Webster, 7, (14), 5. 13 A Final: N. Stoffel d. Z. Wells, (14), 15, 5. 13 B Semifinals: Abraham Sanchez d. Jensen Payton, 2, 8; Young Tang d. Colton Stout, 0, 3. Final: Tang d. Sanchez, 13, 17. 13 Cons. : Payton d. Stout, 3, 6. 11 Small Ball A: L. Wells d. A. Brule, def. 11 Small Ball B: Vincent Stodola d. Alexis Cruz, 1, 0; Andres Araiza d. Antonio Rivera, 0, 2; Rene Sosa d. Gabriel Orozco, 7, 15; Angel Araiza d. Robt. Martin, 2, 0. Semifinals: Rivera d. Stodola, 9, 0; Angel Araiza d. Sosa, 11, 3. Final: Araiza d. Rivera, 5, 17. 11 Small Ball Cons. Semifinals: Andres Araiza d. Alexis Cruz; 6, 8; G. Orozco d. Robt. Martin, 3, 4. Final: Orozco d. Arazia, 16, 8. 11 Big Ball A: Angel Araiza d. Antonio Rivera, 8, (18), 9. 11 Big Ball B Semifinals: Rene Sosa d. Andres Araiza, 11, 2; Gabriel Orozco d. Alexis Cruz, 8, 9. Final: Sosa d. Orozco, 0, 13. 11 Big Ball Cons. : Andres Araiza d. Cruz, 13, 11. Girls 15/17 A: Belisa Camacho d. S. Della Croce, 15, (7) 4. Girls 15/17 B First Round: Irena Hong d. Cassie Hanselman, 11, 3. Semifinals: R. Halabi d. I. Hong, 5, (18), 10; A. Pena d. A. Hernandez, 9, 19. Girls 15/17 B Final: R. Halabi d. A. Pena, 13, 0. Girls 15/17 Cons. : Hanselman d. A. Hernandez, 1, 15. TUCSON -- Andres Cordova grew up watching his dad and brothers play and win handball tournaments. Playing in his first juniors at the 61st National Junior Four-Wall Championships, the youngest of the Cordova family from Juarez, Mexico put the handball world on notice, winning the Boys 11-Under Big Ball singles over Tucson's Ayden Brule, 21-9, 21-13. The young lefty utilized an impressive combination of power and control, forcing Brule to use his off-hand deep in the court and on defense. When asked how long he's been playing handball, Cordova quickly replied, "All my life." Cordova will play Team Juarez teammate Eder Renteria in tomorrow's 11-Under Small Ball final at Noon (Mountain Time). It's an All-NorCal Boys 19-Under final as top-seeded Anthony Sullivan (San Jose) will face Coleman McGrath (San Francisco) in tomorrow's final at Noon. Action continues tonight with doubles competition. The Juniors Awards Banquet will take place tomorrow at La Quinta Reid Park at 7 p.m.
See Wednesday's results and the updated draws HERE. TUCSON -- The second day of the 61st National Junior Four-Wall Championships brought a full slate of small ball matches for every age division. All top seeds advanced in first round play with the rest of singles action finishing up in the evening. Snow and cancelled flights couldn’t keep top-seed Michael Gaulton from getting to Tucson from Canada. Fortunately, Gaulton had a first-round bye and won his first match over Ben Flynn from Co. Waterford Ireland in the round of 16. In the Boy’s 19-Under singles, last year’s runner-up and number one seed Anthony Sullivan advanced over Calgary’s Rory Rackochey in quarterfinal action. In the photo: Oison Hallahan (Co. Waterford, IRE) winds up for a shot against Johnny Cooke (Oak Forest, IL) in 15-Under action. See the updated draws and start times HERE. TUCSON -- Juniors arrived in the Old Pueblo to kick off the 61st National Junior Four-Wall Championships at the Tucson Racquet & Fitness Club. Players jumped on the court as Big Ball singles competition began in the early afternoon and lasted until the early evening. All small ball divisions begin tomorrow with play starting at 9 a.m. The highlight of the day for the juniors was a Pro Clinic where players learned shot anticipation, serve, return of serve, defense and offense. WPH Race4Eight Pros Dave Fink, Sean Lenning, Abe Montijo were joined by USHA Executive Director Vern Roberts as each hosted various station workshops. "When I played in the Juniors, we never had anything like this," said WPH's Development Director Dave Fink. "The kids really enjoyed it, and I hope this is something that can be offered every year." The top Wallball and Small Ball honorees of Timbo, Tyree, Sandy and Danielle are all repeat honorees and the dominating players of our era in these handball disciplines. The other categories may need more explanation but are every bit as noteworthy. The “Legends Award” was decided by a vote from the One-Wall Committee and honors past champions who have distinguished themselves through continued excellence and longevity. In 2016, George Figueroa and Tony Roberts achieved a remarkable string of five consecutive National titles in small ball as a doubles team. This is a rare feat in any sport and is a remarkable achievement. The Arthur "Butterhup" Cussell Award was established by Cussells friends to honor the sportsperson who exhibits character, honor, and sportsmanship on and off the court. In 2015 our committee voted for Paul Lonergan who exemplified these traits. So too has Carlin Rosa who earned our accolades in 2016. The Community Service Award is given to an individual who has changed and influenced handball over many years of selfless service and devotion to our game. The honoree for 2016, Veronica Figueroa, is so deserving of our award for the countless hours she has devoted to juniors and adults alike. If you want to get something done--ask Veronica. Today's sporting culture, places great importance on the idea of winning and thus sportsmanship takes a back seat. However, in most if not all sports, athletes inspire, bring hope and whether they like it or not, they are viewed as role models. Sportsmanship can be defined by the spirit of fairness, respect and fellowship with other people in the competitive arena. The Arthur "Butterhup” Cussell Sportsmanship Award embodies this spirit, and this year Carlin Rosa and Paul Lonergan will be presented with the award. Rosa, as a young teen was taught the game by his uncle. His natural athleticism served him well as he climbed the rankings of pro handball in the Open division. Rosa’s humble nature doesn’t go unnoticed once he steps on the courts throughout the Bronx and Brooklyn. It was on the courts that Rosa chose to emulate players like Albert Apuzzi, William Polanco and George Figueroa, who were renowned for their on-court decorum and fair play ethos. These mentors along with the strong influence of Rosa’s family instilled integrity and character. Paul Lonergan has long been a gentleman on and off the court. Teaming with Al Torres, in the 80s, they were always in the discussion to win a national title, finishing second for three consecutive years before Paul teamed with his brother Joe to win in 1991. Lonergan reached the semifinals in the singles in 1988. During this time and throughout his masters playing career today, Lonergan maintains a high level of sportsmanship and fairness which embodies the spirit of Arthur "Butterhup” Cussell Sportsmanship Award. WEST ALLIS, Wisc. -- The path to the 2016 Milwaukee Classic Men's Open title was a rocky one for Sean Lenning. But once he reached the final, the battle-tested veteran defeated defending champion Luis Moreno, 21-14, 21-18. The top-seeded Moreno cruised to victories in earlier rounds while Lenning was pushed to tiebreakers by Minnesota's Ryan Pesch and Wisconsin's Anthony Selestow in the their quarterfinal and semifinal matches respectively. Based on their performances up to Sunday's match, it seemed Moreno would once again defeat Lenning in Milwaukee. Moreno built an early 9-0 lead forcing Lenning to burn a time out. Once play resumed, Lenning found his groove and outscored Moreno 21-5 to close out game one. In the second, Lenning's hot hand continued and he catapulted to a 20-11 lead over to Moreno only to watch it evaporate to 20-18 as Moreno caught fire. Once again, a time out (glove change) helped Lenning settle in, where he score the remaining two points for the win. Vic Perez and Nikolai Nahorniak defeated Dave and Mike Munson to win the Men's Open Doubles, 21-17, 21-16. Aimee Ulbert won the Women's Open Singles title by defeating Hilary Rushe 21-16, 21-3 in round robin play. Once again, Charlie Keller, Jeff Werstein and the rest of Milwaukee Handball crew hosted another tremendous Milwaukee Classic. See Milwaukee Classic DRAWS & RESULTS HERE. FT. WORTH, Texas -- In what has become the perennial tune-up for collegiate handball in the Southwest and neighboring regions, players from the University of Texas, Texas A&M and Missouri State joined top players from the region to go for the bottom board at the 71st Annual George Lee Invitational. Ten days before they compete as teammates at the Collegiate Nationals in Tempe, Arizona, Sunday’s open singles final pitted Missouri State’s Sam Esser against fellow bear Max Langmack. Looking to improve on his second place finish from the year before Esser outlasted Langmack his teammate to win in two games, 21-5, 21-15. See the match here (https://youtu.be/dNj4SfsG8Ug) Esser later teamed up with Langmack to slam, edging out Dallas locals Jon Flynt and Jeff Wall in open doubles. Missouri State’s prowess continued throughout the lower brackets with Jeremy Young winning the A-singles, Garrett Bacon taking the B-singles, and Ross Colyer defeating teammate Mike Noel in the C-singles. The collegiate women couldn’t overtake their veteran counterparts, as Teresa Bowman defeated Kayla Jones in 2 games to take the Women’s final. Other finals included Mike Sherburne defeating Jerry Garcia in 50+ singles, Frank Swehosky over Karl Stundins in the 60+ singles, and Roger Knudson outlasting Jimmy “Tag” Coolidge in the 70+ singles. The George Lee Invitational is also known for its technological displays. This year on display was the new video scoreboard powered by the Ace Referee app. If you have a ChromeCast and a couple of Android or iOS devices, you can try it for yourself and at your next tournament! Jeff Wall, Southwest Region USHA Board Member, contributed to this report. MINNEAPOLIS -- The U of M Fall Classic & WPH R48Pro Stop #2 wrapped up on Sunday morning at the University of Minnesota's Recreation and Wellness Center. In the R48Pro final, Mando Ortiz and David Fink dazzled the crowd with an intense three-game match which Ortiz won 15-4, 8-15, 15-9. Ortiz came out shooting in the tiebreaker, streaking to a 10-4 lead only to see Fink storm back to make the score close and the outcome in doubt. Ortiz ultimately pulled away for the win. The final capped an incredible weekend for Fink, making his first R48Pro final. Marcos Chavez and Naty Alvarado Jr. once again met in the SR48Pro final. While Alvarado jumped out to an early lead in the first game, through resilient play, Chavez came back to win 15-13 and 15-11. See the WPH write-up with updated rankings HERE. See draws and results of the U of M Fall Classic HERE. If you didn't get to see any of the weekend's action, the R48Pro replay is available at WatchESPN.com or on the Watch ESPN App (Available on iPhone and Android phones). Handball Supporters Bob and Sue Delaney generously offer collegiate scholarships for youth handball players from Arizona and/or Illinois. Originally from Illinois and now settled in Arizona, the couple enjoyed handball in both states and saw the tremendous impact the game had on college students. Eligibility: Any full-time collegiate handball players who are either attending school in Arizona or Illinois or grew up in either state and is an active handball player or playing in a college program. The intent is to reward students with good academic records, and demonstrate financial need. Application Deadline: April 15th of each year. FOUNTAIN VALLEY, Calif. -- It was a furious pace on and off the courts on Sunday as the cameras caught the action inside and out. In the men's singles final, Robbie McCarthy held off Armando Ortiz for the biggest check of the weekend. In the photo, Lupita Bike, Bruce FaBrizio and Naty Alvarado congratulate the finalists. "Just look at this audience," FaBrizio said. It's all shapes, sizes and ages, just like the balls we're using here at Los Caballeros. See the results from the Festival of handball at the SGUSO r2sports site HERE. There were some periods of light rain for most of the morning but it eventually caused the end to play outdoors in the afternoon. The three-wall big ball moved inside where the players proved that they were equally adept at four-wall to the delight of the fans. 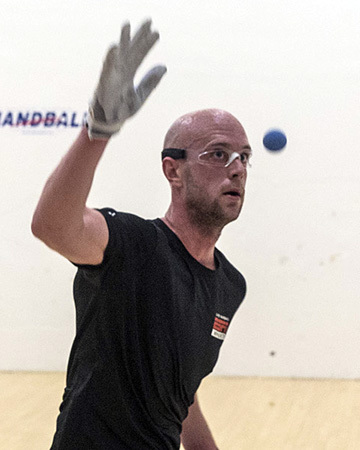 This year, the Simple Green U.S. Open carried two WPH Live streams; one on ESPN3 and the other on www.race4eight.com where outdoor and indoor handball could be viewed at the same time! Replay now available on WatchESPN and the WatchESPN App.